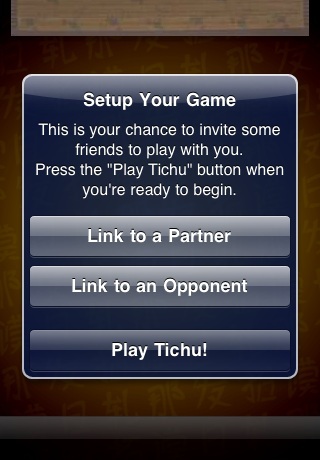 Shall I Teach You About Tichu? 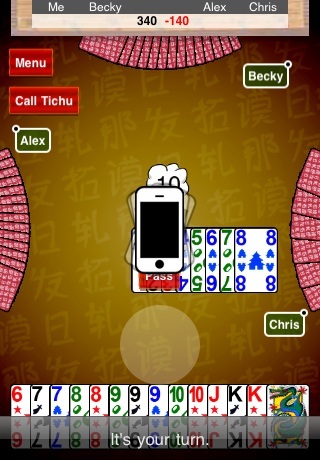 Legend has it that over 642 million Chinese play Tichu nearly every day! I don't know about that. 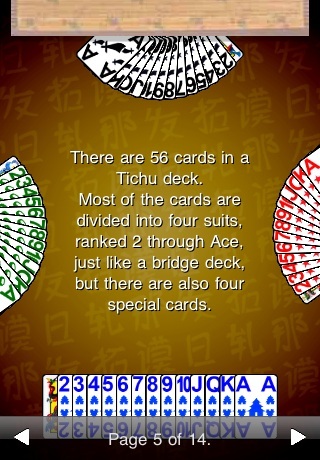 All I know is that Tichu might very well be the world's best card game. 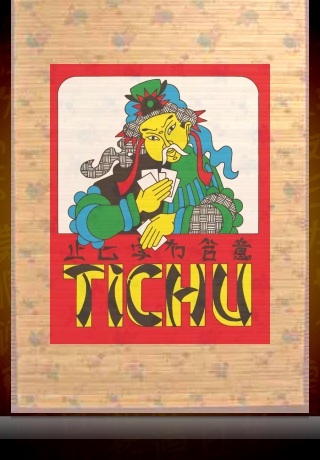 Tichu is a partnership game for four players where partners battle to be the first to play all of their cards and score points. Each hand is filled with strategy and risk. 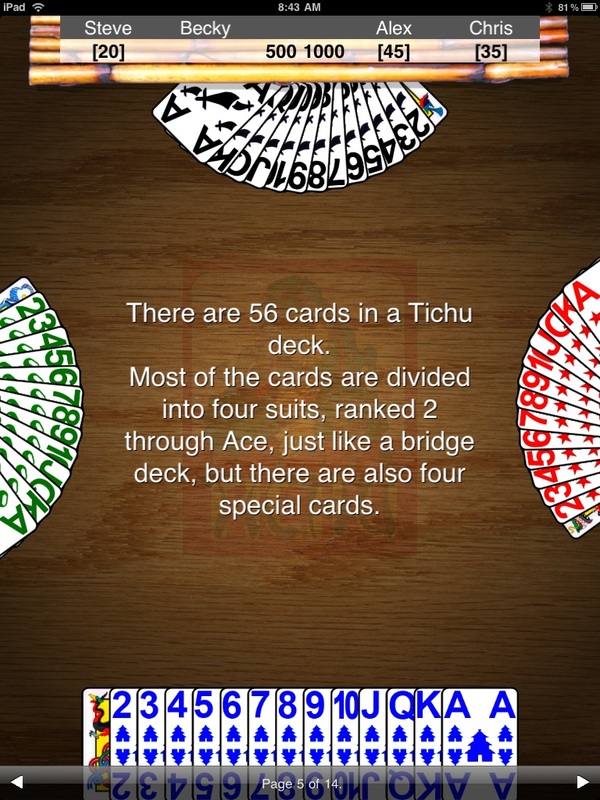 Will you be the first player to play all of your cards? Perhaps you'd like to make a little wager on that? Are you willing to risk 100 points? How about 200? 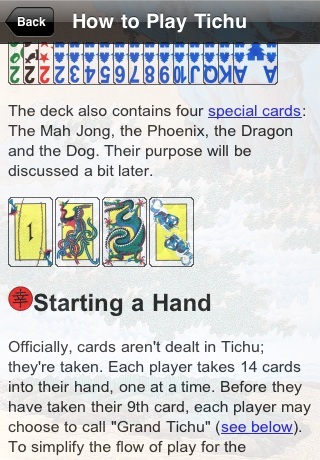 Tichu has long been the favorite card game of all time on BoardGameGeek. Find out why! I promise that you won't regret it! 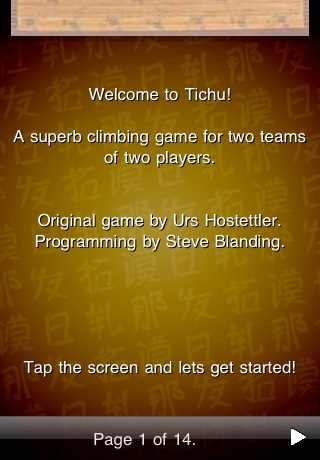 Tichu is my favorite game! 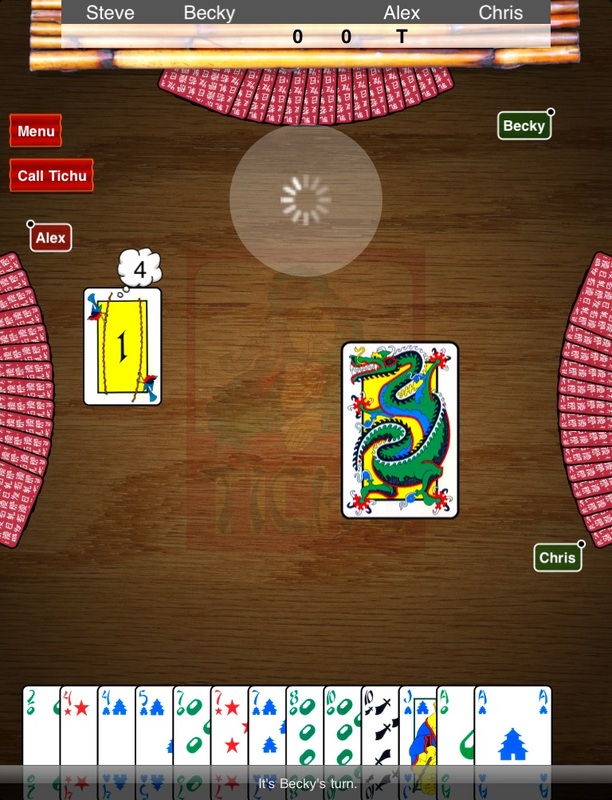 BGG's favorite card game becomes one of the best board game apps on the iPhone (and iPad). Steve Blanding's Tichu is an excellent adaptation of an excellent card game. I expect it to remain one of my most-played iGames for a long time. A portable gaming experience that is not to be missed by card game fans. Steve Blanding has done it again. He is an iPhone card game programming ninja. Fully licensed and authorized by designer Urs Hostettler and publisher Fata Morgana Spiele. 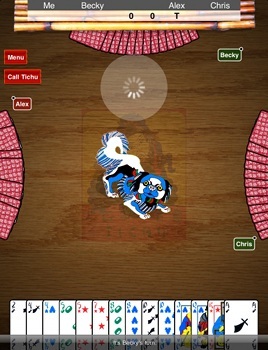 Computer controlled opponents boast a challenging and lifelike Artificial Intelligence that is configurable in numerous ways. 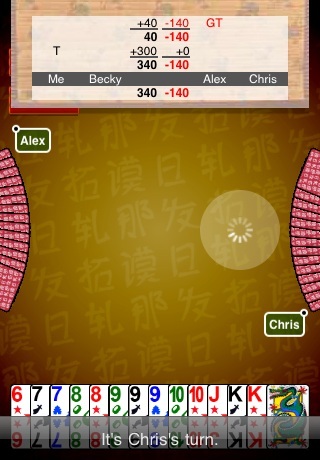 Up to 4 humans can play linked over Bluetooth or Game Center. Extensive tutorial and in-game documentation will teach you how to play and have you playing like a champ in no time. Shake-A-Hint™ feature helps you play while you learn. 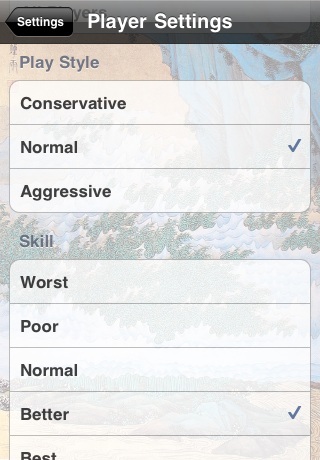 Track your statistics over multiple game sessions. 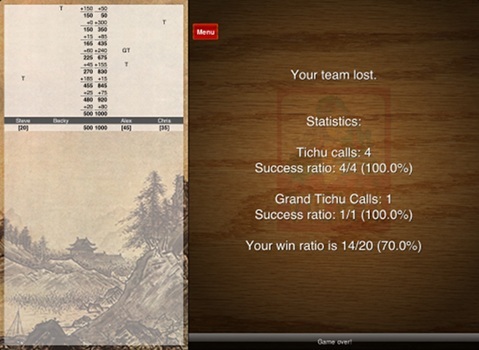 Keep track of your game's progress with a fully automated score sheet. 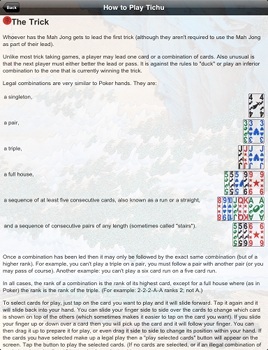 Play in English or German. Optimized high resolution images for iPhone 4 and iPad. 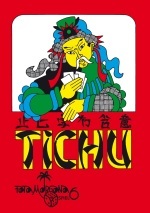 Tichu is a card game published by Fata Morgana Spiele. It was brought to the iPad, iPhone and iPod touch by Steve Blanding. It requires OS 3.1.3 or later. 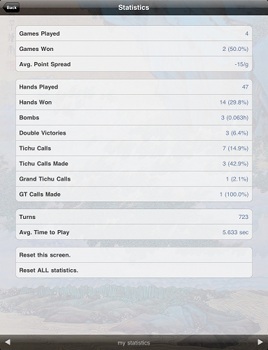 Not all devices support Game Center. 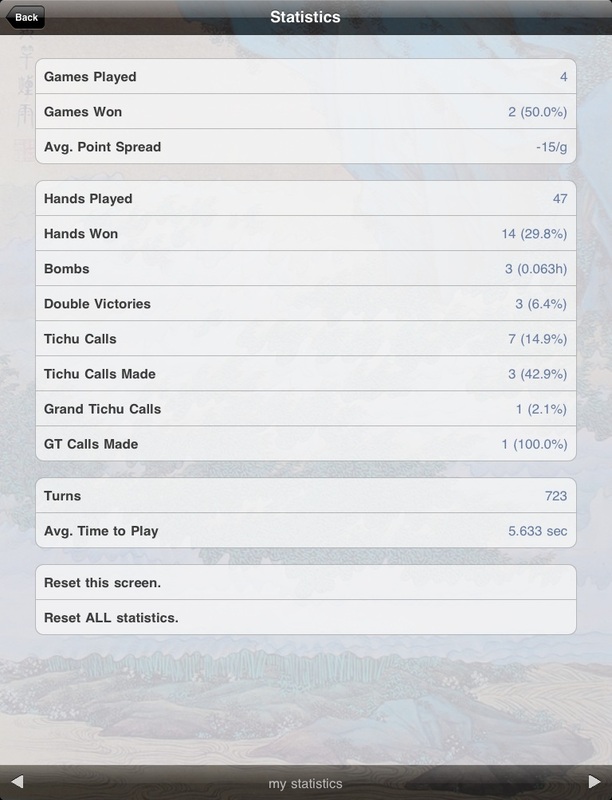 Game Center related functionality (achievements, leaderboards, and wide-area networked games) requires a device that is capable of supporting it. 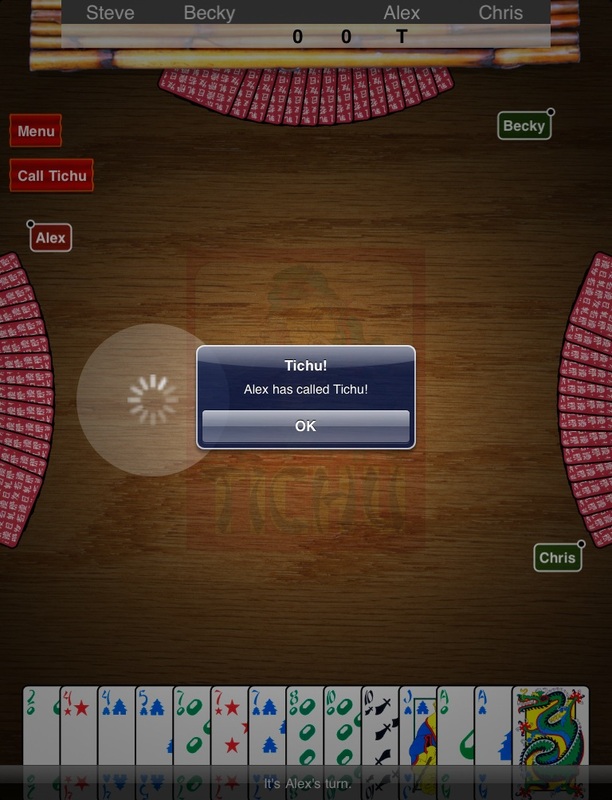 For a fascinating look at some of the things that went into the making of this game, read Steve's article on Bringing Tichu to the iPhone Family! 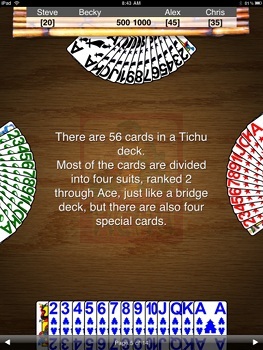 For another superb card gaming experience, you really should check out Mü! 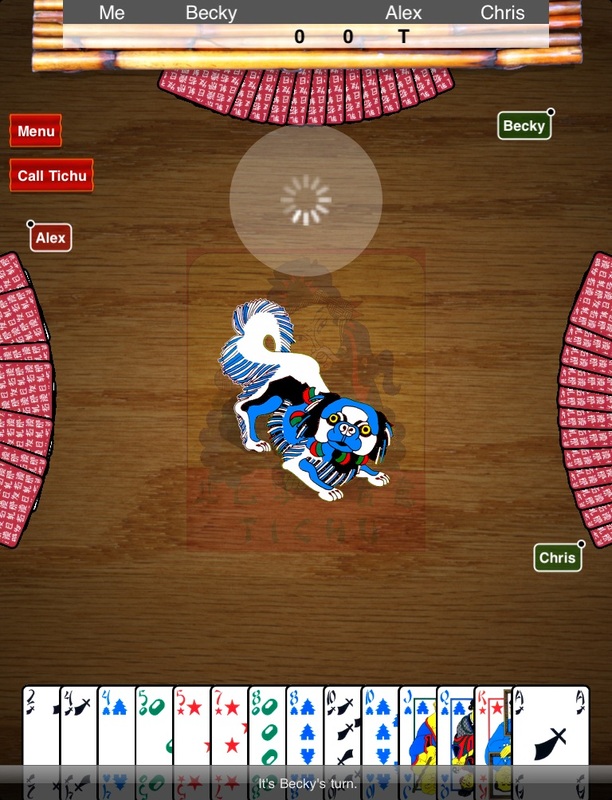 For a fun and silly way to liven up your next game night, take a look at Start Player! And for a much lighter experience, check out FireworksToy!